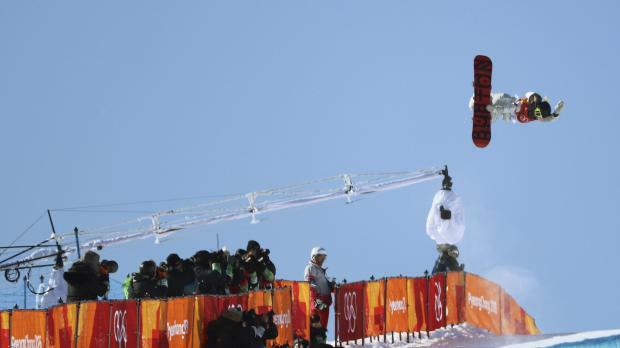 Chloe Kim of the US competes. The 17-year-old Kim produced a top score of 98.25 points on her third and final run to beat Liu by almost 10 points in front of the largest crowd seen at the venue so far to live up to her billing as a heavy favourite for the gold. Liu was the only woman who seemed capable of challenging Kim and will be delighted to earn her first Olympic medal at the third time of asking, as she also denied the United States a chance of sweeping the podium. "I knew I wouldn't have been satisfied going home with the gold but knowing I could have done even better," said Kim, who admitted to being hard on herself and thought she could have done even better on that final run. "So that final was just for me and to show myself that I could do it and put down the best run that I could." Kim, who leads the world rankings and was the overwhelming favourite coming into the Olympics, admitted there had been pressure on her to succeed. "There has definitely been a lot of hype around this, on just a two-hour time period (for the final). It is pretty nerve-wracking as this has been a dream of mine since I was a little girl," she added. "I put a lot of pressure on myself and wanted to put down the best run I have ever done." Gold left it late but delivered when it mattered, saving her best for the final round, which she started with a risky 1080 at the top of the run on her way to scoring 85.75. The 21-year-old, who suffered a separated shoulder shortly before the 2014 Sochi Olympics, said coming third was tinged with sadness as it bumped team mate Kelly Clark off the podium. "It was a bittersweet position to be in when it came down to Kelly and I for third position," Gold lamented. "She is someone I have looked up to ever since I started snowboarding, even more so after I got to know her. All the work she does behind the scenes is something I have tried to incorporate." Clark, competing at her fifth Games, showed she still has plenty to teach the younger generation with a score of 83.50 on her third run. However, the day was all about Kim.